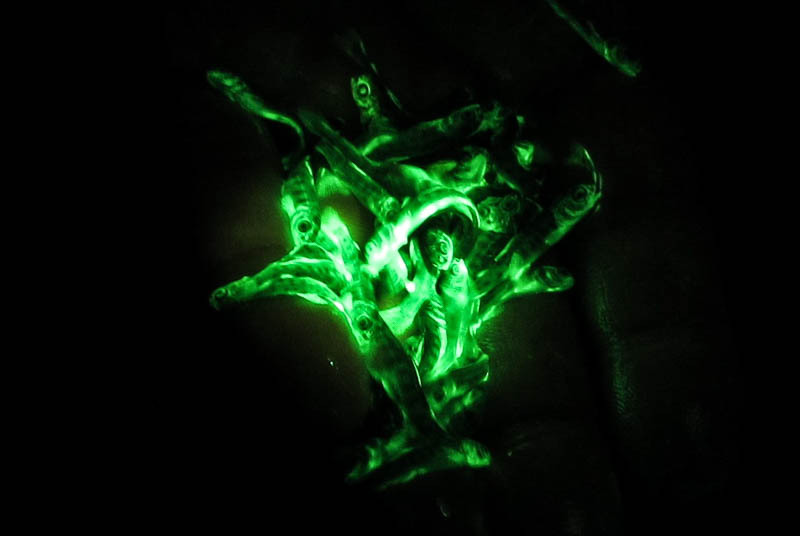 NIGHTSEA is the preferred provider of detection equipment for Syndel SE-MARK calcein solution for mass marking of fish. Visit the web pages for these products for further information, or contact us directly if you have any questions. 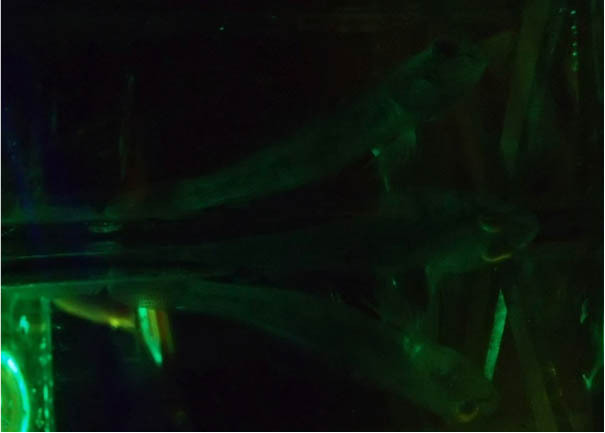 Methodologies for the mass marking of larval or juvenile fishes are needed for various studies, such as assessing the success of fish stock supplementation programs. 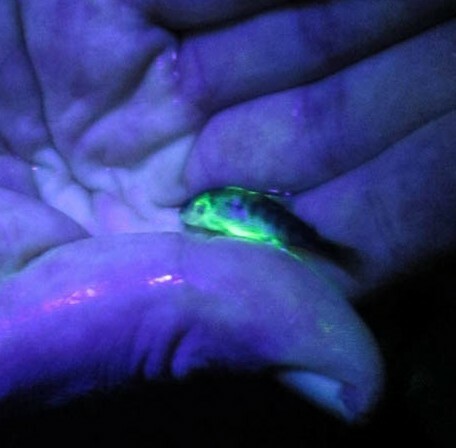 A promising treatment involves immersing fishes in a solution of calcein, a fluorochrome compound that chemically binds with alkaline earth metals such as calcium, and upon binding, shows a marked increase in fluorescence . 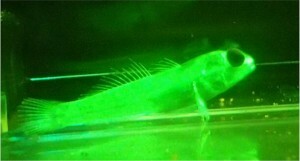 This treatment marks otoliths and also produces a brilliant green fluorescence in fin rays and scales. Once fish have been marked you need a means to distinguish marked from unmarked individuals, and that is where the NIGHTSEA gear comes in. 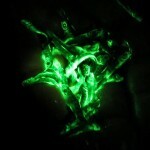 Several researchers who are conducting approved calcein studies have acquired the BlueStar for their work. 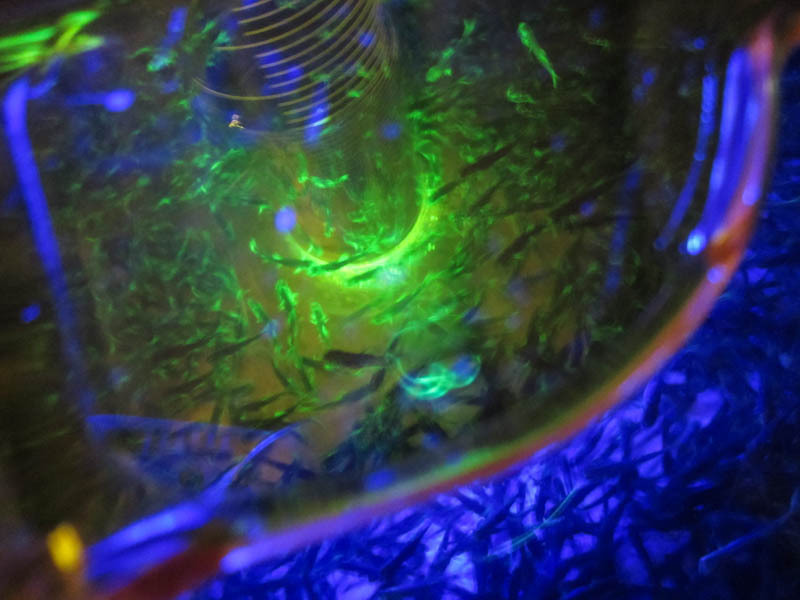 Fisheries Biologist/Researcher Heidi Isner of the Kings River Conservation District is using it successfully for a mark – recapture study, detecting calcein-marked rainbow trout (Oncorhynchus mykiss) fry in their streamside incubator facility. Drs. 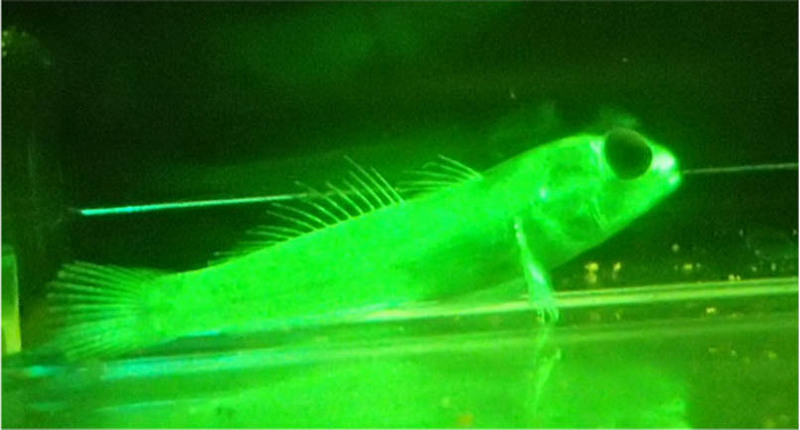 Kelly Grant and Greg Andraso of Gannon University (Erie, PA) are using it successfully with round gobies (Neogobius melanostomus), an invasive fish in the Great Lakes. In addition to the whole-animal imaging described above, some researchers need to look at calcein-stained specimens in greater detail. The NIGHTSEA Stereo Microscope Fluorescence Adapter is an economical way to add a fluorescence capability to virtually any existing stereo microscope. 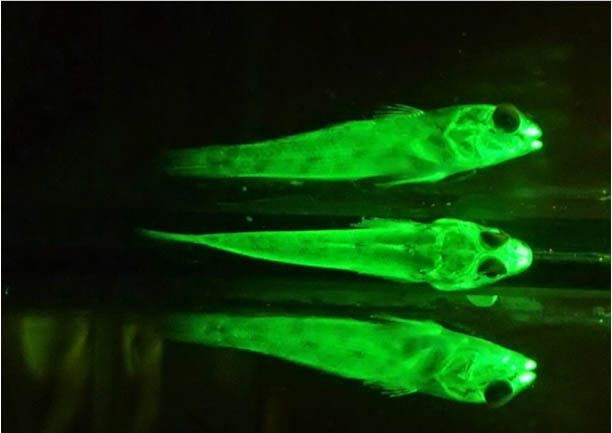 Dr. Maria Abate of Simmons College is using the fluorescence adapter with calcein for a laboratory study of the effect of growth environment on bone development in zebrafish. 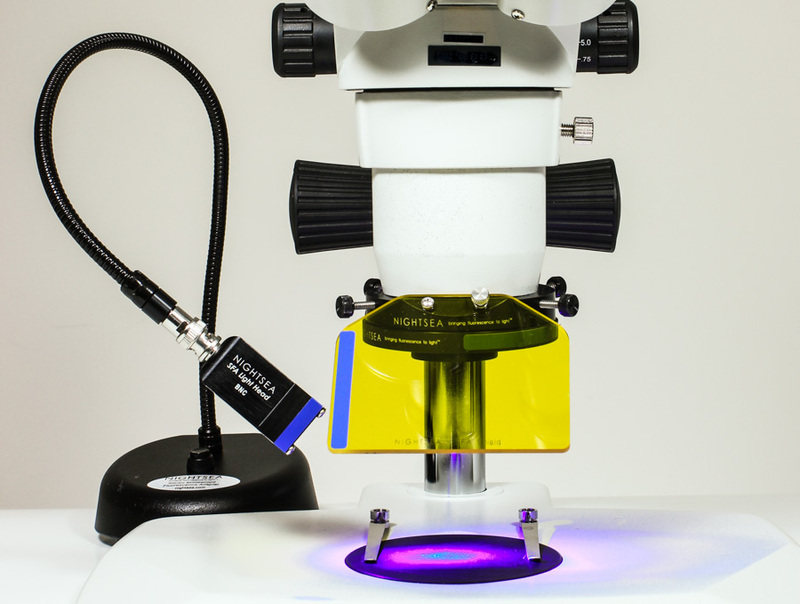 While there are now 6 different excitation/emission combinations offered with that system, for calcein work you only need the Royal Blue combination, the same wavelengths that are used in the BlueStar and filter glasses. Calcein staining of fish to be released into the wild is not yet approved for general use. It is being studied as an Investigational New Animal Drug (INAD), collecting the data that will be used to support a new animal drug application (NADA). The study is being overseen by the Aquatic Animal Drug Approval Partnership Program (AADAP) at the U. S. Fish & Wildlife Service. 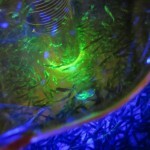 If you are interested in using SE-MARK (calcein solution) to mass mark fish, please contact the AADAP office. The calcein formulation for fish studies is available exclusively from Syndel under the trade name SE-MARK®.